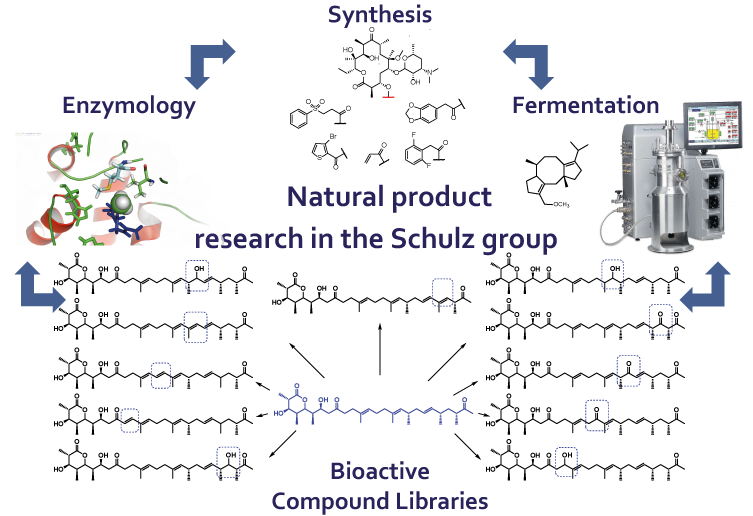 The Schulz group pursues different projects to break up important limitations in current natural product research. Both the limited availability and derivatization of different compounds are addressed, rendering new compounds with diverse biological activities available. Polyketides form a large family of natural products and many polyketides are applied for the treatment of diseases such as cancer or infections. However, the large and polyfunctional structures of many polyketides complicate the derivatization that is required to develop them into clinically useful compounds. Biosynthetic pathways show an enormous capability of generating molecular complexity. Genetic engineering of polyketide-producing bacteria is thus used to direct the biosynthetic derivatization of polyketides, yielding compounds with altered biological activities. Via site-directed mutagenesis of key enzymes from the biosynthetic pathway, predictable redox derivatives of the parent compound pre-monensin are synthesized in the bacterium Streptomyces cinnamonensis. Cultures of Streptomyces cinnamonensis yield specifically modified derivatives of pre-monensin when supplied with the synthetic malonic acid derivatives shown here. product. In a first study, organic synthesis, enzyme engineering and fermentation technology are combined towards the derivatization of the antibiotic erythromycin A. In enzyme-directed mutasynthesis, engineered enzymes are utilized inside a microbial producer to accept synthetic building blocks as substrates for the targeted derivatization of a natural product, in this case the antibiotic erythromycin. 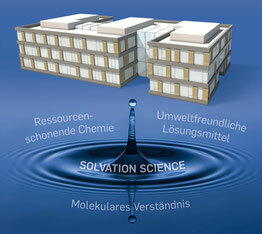 chemistry to identify new molecules with interesting antibacterial or anti-tumor activities. In many cases, natural sources do not provide enough material to investigate the promising biological activity of natural products. This is particularly true for members of the terpenoids family of natural products. We express key enzymes towards terpenes in baker’s yeast to synthesize preparative amounts of the corresponding compounds in synthetically meaningful quantities. Baker’s yeast is genetically engineered to produce fusicoccadiene (FCdiene) from the fungus Phomopsis amygdali. It carries several mutations in its primary metabolism (mevalonic acid pathway) to channel biosynthetic capability towards the targeted compound.